This my friends is what $85 of hydrangeas looks like. Yes, those shriveling up, browning hydrangeas were still full price. That's what happens when you buy at the end of the season and the cheaper places like Lowes are sold out and you have to go to the expensive nursery Bordine's. I have wanted those gorgeous big white snowball hydrangeas for 3 years now. When mom and I did the landscaping last year I bought 2 "Annabelle" hydrangeas and planted them out front. The first year I didn't get any blooms. This year they bloomed like a queen Anne's lace and just a few petals, I didn't understand. 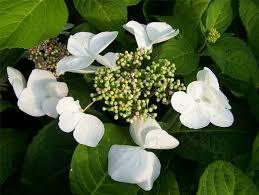 I sent a picture to one of mom's gardening friends and she said it was a "lacecap" hydrangea. So Bordine's had not one, but 2 plants mis-labeled the year before. I called them to complain and they were going to not do anything since I didn't have my receipt (a year later). Anyway, they finally said I could dig them up and bring them back. But then Doug was too embarressed to do that. So we decided to dig them up and relocate them to the other side of the house and get 2 new ones. So yesterday mom came over and that is what we did. The North side of the house. The big plant is a rhodedendron that gets beautiful pink flowers for 2 weeks a year, otherwise looks like this crazy bush. And those are my precious peony plants on either side of it. That spot isn't great for peonies because it doesn't get full sun. The front of the house. So there we have the 2 lacecap hydrangeas with a large butterfly bush in the middle. The backyard view and the fence in front of the kayak rack. After working all day, with a stop for lunch, we were done. So now I have 2 "little lime" hydrangeas flanking the butterfly bush. They will have light green big blooms that will fade to this kind of dusky pink in the fall. It's not exactly the big white blooms I wanted, but I think they will still be nice. And my hydrangea research showed the little lime was a lot hardier and easier to grow than the Annabelle. They should be about 5 feet tall too so should be a good fit for that space. Moved the lacecaps to flank the rhododendron, and there's one small empty spot where next year I'll probably get another hosta to balance it out on the right side. And finally the peonies will enjoy full morning and afternoon sun in front of the kayak rack and hopefully be full of blooms next year. So, I think I'm done with the landscaping. We used barrier cloth to help block weeds, and I'll have to re-mulch every year, but hopefully the very hard parts and high maintenance parts are done. Today will be a fun day of trying to cram the cat into her carrier for a trip to the vet. This morning I caught her peeing in the laundry tub and then into August's carseat (twice) EWWWW. So we're getting her checked for a UTI or to see if this is just behavioral. I like this cat, but I absolutely will not spend my days searching for and cleaning up cat pee. So who knows. Last weekend the bookclub girls had our 2nd annual little getaway, and it was wonderful. We went to St. Joseph right on Lake Michigan. We got a hotel, walked on the beach and by the pier, ate delicious food, window shopped, and most importantly had some kid-free time and time talking about our lives (which of course included lots of talking about our kids and husbands) haha. I am so blessed to have these friendships. We've had our bookclub about 9 years now, and faithfully get together once a month for rotating dinner at each others houses, we always choose a book, but don't always all read it and talk about it a couple minutes, but it has just turned into a group of friends meeting, eating, talking, and sharing life together. What a blessing. We've been through so much together, marriages, my divorce, movings, the birth of 11 kids and 2 more still on the way, and the death of a spouse. It's been a true blessing to share life with these wonderful, encouraging Christian women. The girls, minus Courtney, she couldn't make it this year (or last year! :( ) and we met Kathryn, who has since moved to Chicago, there. We are daydreaming about bigger trips, "bookclub girls do Prince Edward Island" or Europe. Those are pretty far off in the future though as some of us are still having and nursing babies. But maybe someday. Doug did a great job of manning the fort at home. And I think August was a good sleeper for him. He's been all over the map lately. Either sleeping all night or getting up anywhere up to 10x. It's crazy. The night before last was one of the worst. He went to sleep 9, up at 12:30, wouldn't fall asleep till 2am, I picked him up no less than 6 times from the crib to hold him, rock, sing, hush, nurse, you name it. Nothing. Finally laid him on our bed till he fell asleep, then transferred. He still woke up another 3x because his binky fell out. Then up at 7. The next day was one of the worst days for me yet. All day he was fussy. He would cry if I was ever out of sight, and even when I was close he just seemed to cry on and off all day. The only cry-free time was our stroller walk in the park. I was exhausted. I literally screamed at him twice. Screamed. Loud. Which of course scared him and he screamed more. It was a real low in my mothering life. Two times I called Doug at work crying and sobbing. I felt horrible. I was in the bathroom looking at my Colossians Bible verse and begging God to give me patience, compassion, and kindness and then I went straight over to him and screamed at him to shut up. And then burst into tears. I felt like a monster. My poor sweet baby being screamed at by the one who is supposed to love and comfort him. Finally Doug came home and like the flip of a switch he was fine. We went to our friend's who made us a delicious Indian feast and we met their new baby. Then came home, put August to bed. He laid down and didn't even cry one time. He slept all the way until 3am when I woke HIM because my breasts were painfully full and they woke me up. So nursed him, put him back to sleep and not even a peep even though he was awake, and he slept till 8am. What the heck. But seriously I'll take it. So I don't know what is going on. I think I need to come up with some strategies for the next time. I know he likes walks, he likes being in the backpack, it might just mean sitting with him and doing nothing. Maybe going for a drive. But I don't ever want to do that to him again. So I continue to pray for patience and that God would increase my love and care for him. I wonder if I might finally be getting my period back and some of that could be related to PMS? But anyway, it was a true low.